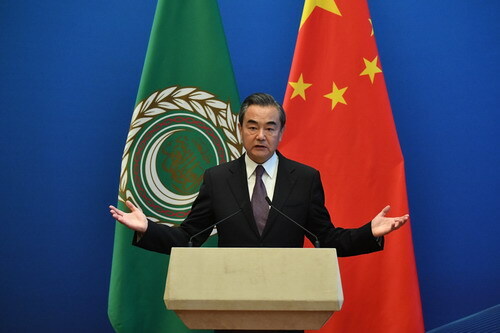 On July 10, 2018, State Councilor and Foreign Minister Wang Yi met the press after attending the 8th Ministerial Meeting of the China-Arab States Cooperation Forum, expressing that as the world's largest developing country, China has always been a member of this important group, and shared weal and woe with countries of this group. Wang Yi said that China has always attached great importance to its relations with developing countries, because safeguarding the interests of developing countries is equivalent to safeguarding China's own interests, and China's own development means the growth of the overall strength of developing countries. Regarding the relations between China and developing countries, President Xi Jinping has clearly pointed out that no matter what stage of development it reaches and how the international situation changes, China will continue standing together with developing countries and will be a reliable friend and sincere partner of developing countries forever. Wang Yi said that China's unequivocal stance is based on China's actual national conditions and stage of development, and also stems from China's historical encounters and institutional attributes. Being subjected to foreign aggression in modern times, China understands more than anyone the developing countries' persistence in achieving and safeguarding sovereign independence. Rising from poverty and backwardness, China knows more than anyone the developing countries' desire to revitalize their economies. Upholding fairness and justice, China understands more than anyone the expectations of developing countries to safeguard their legitimate rights and interests. Wang Yi pointed out that at present, the international landscape is undergoing unprecedented major adjustments and major changes. Unprecedented opportunities and severe challenges are brought to developing countries at the same time. In the face of the new situation, China is ready to, together with all developing countries, including the Arab world, strengthen unity and cooperation, expand and strengthen South-South cooperation while realizing its own development and revitalization, jointly build a broader development partnership, foster a more open world economy, and increase the representation and voice of developing countries in the global governance system, thus not only safeguarding the overall interests of developing countries, but also making new contributions to the cause of human progress.